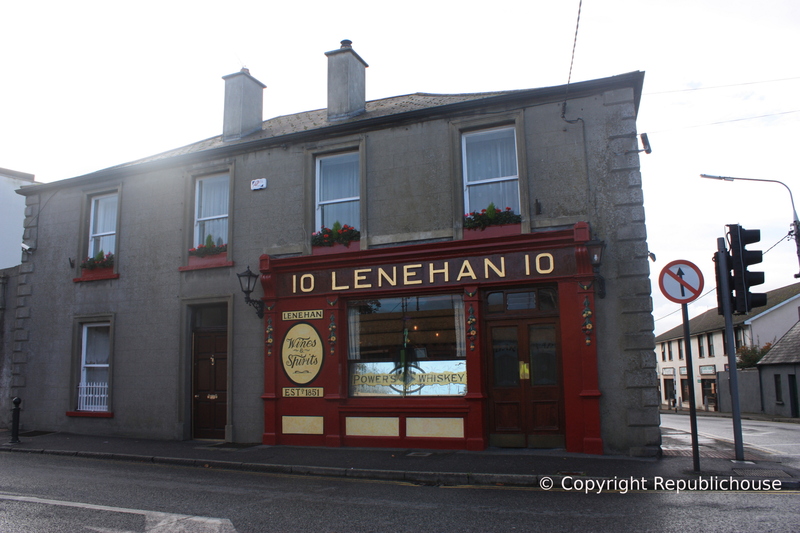 Somewhat outside the centre of Kilkenny City you will find the lovely traditional Irish pub, Lenehan’s. Situated on the junction of Barrack Street and Castlecomer Road, the pub lies away from the main party-goin’ strip where crowds paint the town red on a regular basis. Or should we say, paint it black & amber (the colours of Kilkenny’s mighty hurling team)!? 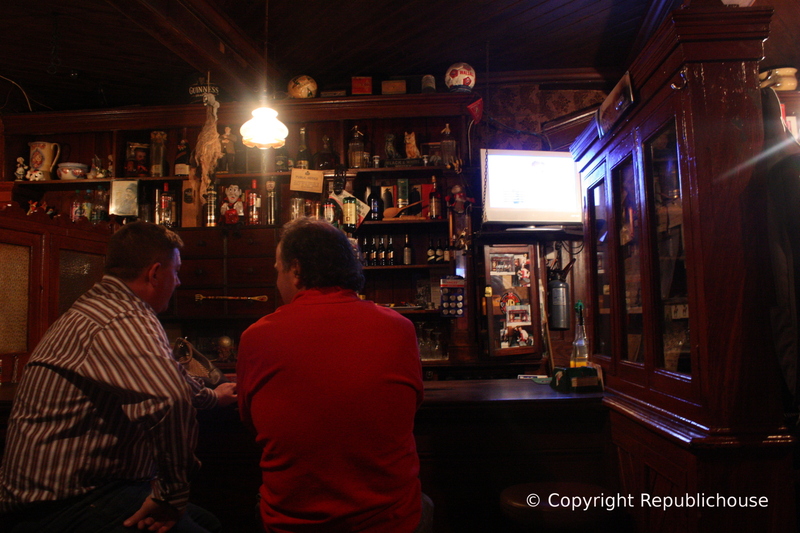 Whilst not as old as Tynan’s Bridge House Bar – Kilkenny’s oldest pub – Lenehan’s nonetheless has equally as much charm. Lenehan’s exterior signage proclaims it to have been established in 1851 but the building itself has stood for at least two hundred years. The diagonal, wooden slat bar counter in the back bar has a distinctly 1960’s feel, yet there are clues to a much older era; note the split stable door to the far left, for horses to be tended in older times. In the late 1890’s, Laurence Long, a tea, wine & spirit merchant began running a shop in what is now Lenehan’s pub. It was not until 1911 that the grandparents of current proprietor Jim Lenehan, namely Dan and Rose Lenehan, purchased Long’s Pub and brought the pub under successive generations of Lenehan-family stewardship. Lenehan’s interior is mainly of mahogany-coloured wood, together with an old-style, floral-print wallpaper. The bar counter has wooden panelling, tilting towards the floor, suggesting that it has been renovated at some point, with a style whispering of the 1950’s-60’s. The bathrooms also point towards this later but now dated renovation, with white tiles covered in a yellow and brown floral motif, truly of a 60’s era! The bar floor consists of plain, wavy tiles hinting at a similar point of time, where once flagstone floors stood. 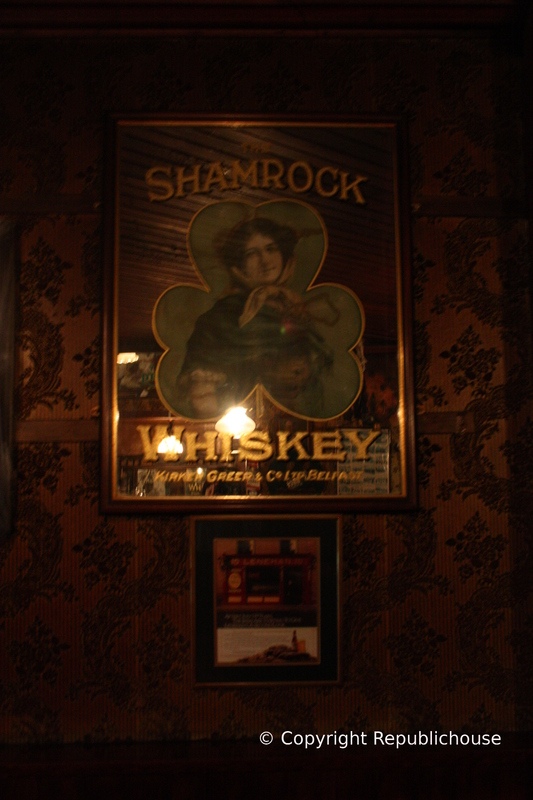 Throughout the pub hang an assortment of antique mirrors and classic advertising posters among them recounting Shamrock Whiskey, O’Connell’s Dublin Ale, James Sullivan & Co. Ltd., James St. Breweries Kilkenny, Clarke’s Plug, Player’s Navy Cut and Corcoran & Co. of Carlow. All of this in combination create the character of Lenehan’s and make it the special place it is, vintage with personality. On our arrival we felt drawn to the back bar as this contained the open, stove fire. 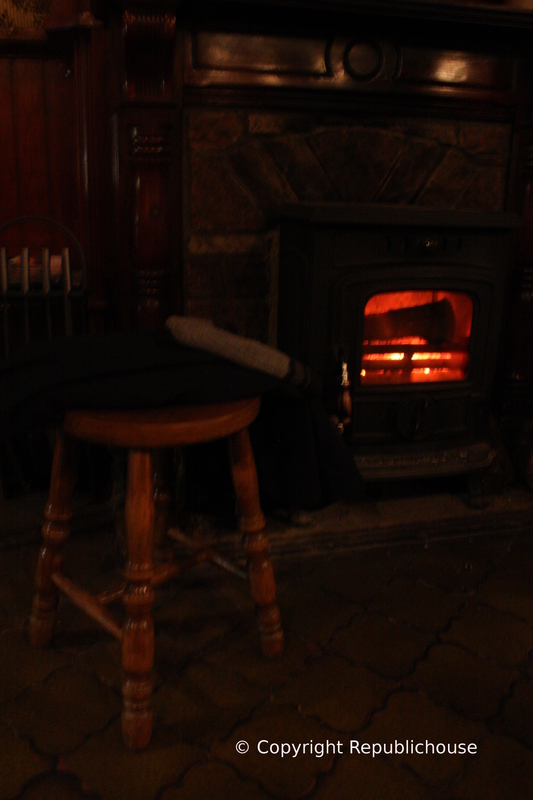 We rested a few of our rain-sodden belongings next to it on a stool to dry against its hearty warmth. We ordered a Guinness and a Heineken, which came to €8.80 (Kilkenny prices are great!) and we proceeded to have a good few more throughout the night. 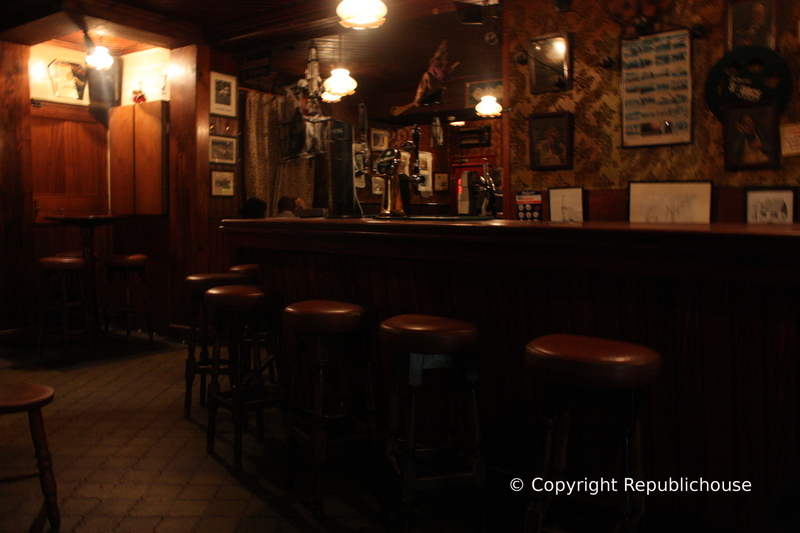 The layout of the bar is an inverted L-shape, very similar to The Cobblestone pub in Dublin. We followed the ‘L’ around to the far end. Here we found two big tables suitable for larger groups, one on each side of the fireplace. We sat at one, the other one already taken by a lively group of 20-somethings eating pizza (bit strange! ), chattering away and kicking off a sing-song. Previous to that, we had enjoyed the tune or two playing in the background on the pub’s radio, The Beach Boys and The Beatles among them. Such a fine soundtrack is what most likely got them in the mood for song or two in the first place, mind you. We moved to the lovely, original front bar and got chatting with some locals. Note the glass, mahogany cabinet to the right, still housing many old invoices. Even though our neighbours at the next table sang some nice songs, and some of them could actually sing, it was time to move to another part of the bar after the 10th or so song as the noise levels rose. We decided to move all the way to the front bar, to check it out. The front bar is divided into three sections by partitions of reddish wood, one with a large glass cabinet containing a miscellany of old invoices, weights, dockets & postcards. We sat on sturdy bench seats along the wall, near to the front door, within one of these sections feeling very much like we were in an old railway train cabin. From where we were seated, we spotted the old stock drawers behind the bar, denoting the pub’s former role as a general merchant. We got talking to a couple of locals here in the front bar, and discussed everything from parenting to the government to Kilkenny tourism and of course, about Lenehan’s itself. Having heard that we were staying beyond the weekend, our new friends encouraged us to visit Lenehan’s early on Monday morning for a true insight into the role of the pub for locals in the community. Local workers pop into the pub first thing in the morning each weekday for a coffee or a light breakfast and to discuss the day’s news (and hurling no doubt), before heading off to work. Bearing in mind too that a large group of customers can order in a pizza takeaway to the pub on a Saturday night, we formed the impression that Lenehan’s offers a homely meeting point for locals in the community, something notable of all the great, genuine Irish pubs. We didn’t actually make it in first thing on Monday morning ourselves in the end. A warm bed and an all-you-can-eat hotel breakfast put paid to that idea on this particular occasion. In our defence, after breakfast we then undertook a much anticipated visit to the medieval Kilkenny Castle, which did not disappoint and was a steal at only €6 for the castle tour. We’d highly recommend a visit to the castle, as indeed we would recommend a visit to Lenehan’s. Someday, we’ll make it back for that Monday morning coffee! Visit because: In party-town Kilkenny, Lenehan’s offers an alternative experience, off the beaten track, where you can mix with the locals over a lively chat in authentic 19th Century surroundings. Great write up. Looking forward to a visit in April. Thanks for the feedback Nate. Glad that we could help provide a good recommendation for you. 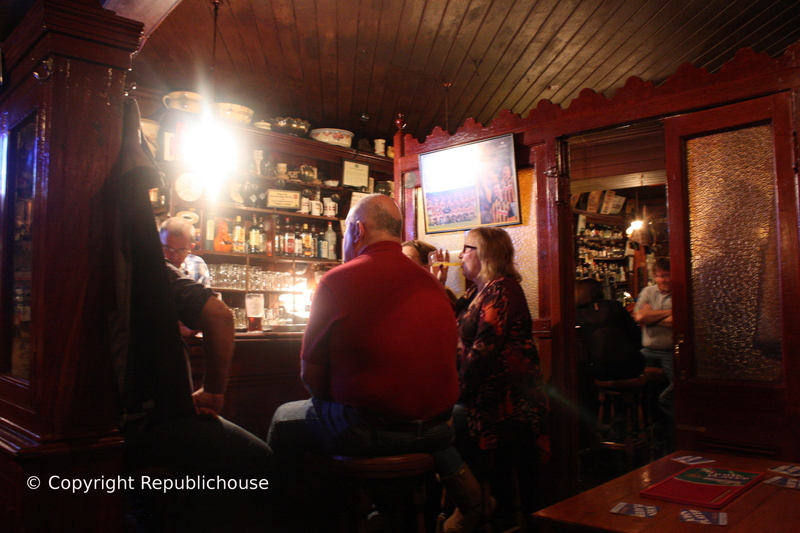 If you are Kilkenny-bound, keep a look-out on the blog in the next few weeks as we’ll be talking about another Kilkenny gem – Tynan’s Bridge House Bar. Damien & Angelika. Actually, we will be spending two days in Dublin and 5 days traveling the country side visiting classic, old style pubs. Have alot of ideas but nothing set in stone, we are going to be spontaneous and see where the road takes us. I really appreciate the recommendations…keep up the great work. Ah, being spontaneous sounds like a great plan! You’ll be sure to find some real pub gems along the way. Anyway, if you keep an eye out here there’ll be plenty of recommendations too so they may help a little. Thanks so much for the positive feedback. Great to hear. Happy pub planning! It’ll be April before you know it.